OLGA WALLÓ lives in Prague, an old and beautiful European city, full of cultural riches. Her first book was published in the Czech Republic in 1998, only nine years after the fall of communism there. 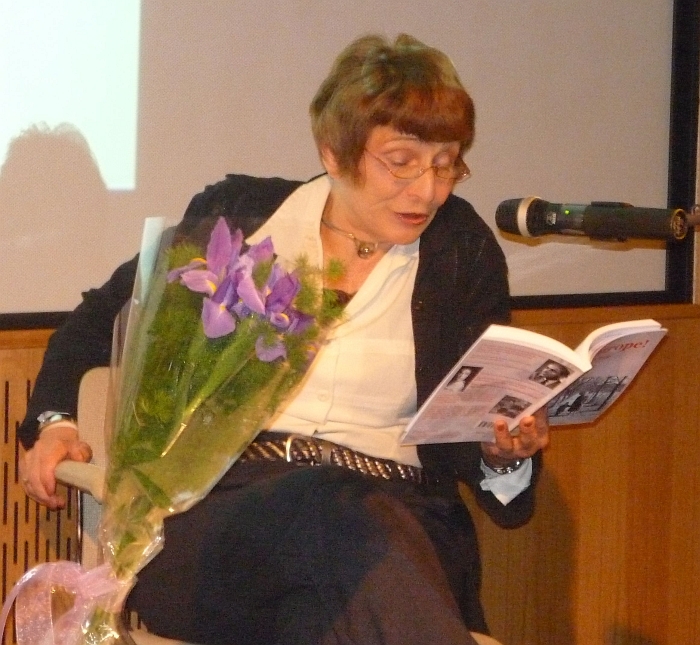 She has worked for Czech TV for 35 years as a translator and dubbing director and taught dubbing at the Academy of Art. She has translated plays and novels. Her work includes her "Collected poems 1958-98", an autobiographical novel trilogy and a true story about cancer, "Secondary Profits". Her short stories and essays have appeared in periodicals. She regularly contributes journal essays on philosophical aspects of every-day life. Olga Walló is an Honorary Advisor to The International Proverse Prize. Tightrope!—A Bohemian Tale (2010)translates the middle volume of Olga Walló's admired trilogy. The narrator of Tightrope, an extraordinary, curiously intellectual small girl, undertakes the demanding and costly burden of comprehending the world. Her father – a peculiar leftist intellectual, and her mother, a neurotic actress, belonging to an old farming family – are more or less social outcasts, who fight for survival. The situation prevailing in Socialist Eastern Europe in the period after the Second World War – setting and inherent part of the fabric of this tale – produces incidents which are funny, cruel, and absurd, eliciting both laughter and compassion. The language of the Czech original is complicated and multileveled, intermixing rural dialect with communist Newspeak, theatre jargon with the lowest "proletarian" argot; lifted by the language of philosophical reflections and poetical associations. But there is one word which is not spoken: shame. Shame, which becomes the fatal stigma of the sophisticated author. "A novel of unexpected originality, exceptional for its remarkably engaging testimony and its uncommonly sophisticated and refined structure and style. "That the fateful year of 1948 – after which 'nothing can happen because everything has already happened' – was the year of the author's birth is symbolic. The novel is set in the 1950s, the time of the author's and narrator's childhood, and everything that happens around the child is seen through her eyes. Her entire childhood is strange – matched and in part caused by the strangeness of this tragic and bizarre interlude in our history. Much is concealed in the single sentence: 'The farm, the focus for our faith for the future and any remaining hope deriving from the past.' The key to understanding this tale is the deep-rooting trauma arising from the collectivization of a large part of the family property." — Vladimír Karfík, RESPEKT 27, 2 - 8 July 2007 (review of original novel in Czech). Now translated into Chinese by Dr Chapman Chen and published by Proverse in December 2011. Olga Wallo travelled to the USA to read from her first novel, translated into English ("Tightrope! -- A Bohemian Tale"), at the Czech Centre in New York in January 2011.
REVIEW OF OLGA WALLO'S "TIGHTROPE! A BOHEMIAN TALE" (translated from the original in the Czech language. See Michael O'Sullivan's review, "On a Psychological Tightrope" in Asian Cha, March 2012 (Issue 12). A most successful literary evening was held in Central Hong Kong on Thursday, 23 June 2011, hosted by Friends of the British Council and the Czech Consulate-general; supporting organisations Gifted Education Section, Education Bureau and Proverse Hong Kong. Authors Olga Walló (Czech Republic, Tightrope! A Bohemian Tale) and Rupert Chan (Chocolate's Brown Study in the Bag) explored the experience of writers in the Czech Republic and Hong Kong, moderated by Gillian Bickley, Proverse Publisher. On Monday, 27 June 2011, Olga Walló shared her English book "TIGHTROPE! -- A Bohemian Tale" at Hong Kong Arts Centre 2/F foyer. Among those present were friends from MCCM Publications and those with a particular interest in Eastern and Central Europe. For the collectors among you, here is the Event flyer still, for you to download. On Sunday 26 June 2011, Olga Walló was guest poet and writer at Kubrick (next to Broadway Cinemathèque, 3 Public Square, Yaumatei, Kowloon, Hong Kong). Moderators：Polly Ho, Adam Cheung, Florence Ng, Wong Wai Yim.